"The hand of the diligent will rule, but the slack hand will be put to forced labor." - King Solomon, (Proverbs 12:24, NASB). Secular Europe is becoming a slave to their large debt load. If only they had listened to the wisdom of Solomon! Atheists commonly assert that Bible believing Christians hate so called "modern science"/modern doctrines. Last time I checked Darwinism is over 150 years old and Henry Morris's creation science movement is around 50 years old. By the way atheists, newer is not necessarily truer. Yet, many arrogant and illogical atheists continue to commit the appeal to novelty logical fallacy and disparage the Bible. 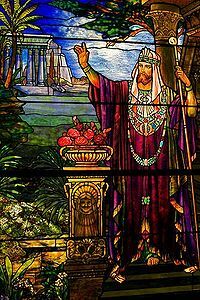 King Solomon taught the value of hard work and thrift in ancient times and if more modern secular European leaders paid attention to the wisdom of Solomon their countries would not be mired in debt and in such dire straits! Checkmate atheists! Once again, the Bible shows itself to be tried, true and triumphant! One more, the "superior modern atheist intellect" is bested by God. Yet again, atheist pride cometh before their fall. History lesson for "atheist intellectuals": While King Solomon's reign was marked with prosperity, the modern atheist regimes of Mao Zedong and Joseph Stalin were marked by atheist regime created famine. And of course, both these atheist leaders were huge fans of evolutionary pseudoscience. Divine imparted wisdom triumps over "superior modern atheist intellects"! Don't miss these pictures with captions! I would rather depend on Christian Midwestern American farmers for my produce than depend on someone like the atheist and evolutionist Trofim Denisovich Lysenko who based his agricultural notions on evolutionary quackery. Are atheists smarter than the average bear? This page was last modified on 7 January 2012, at 08:10.